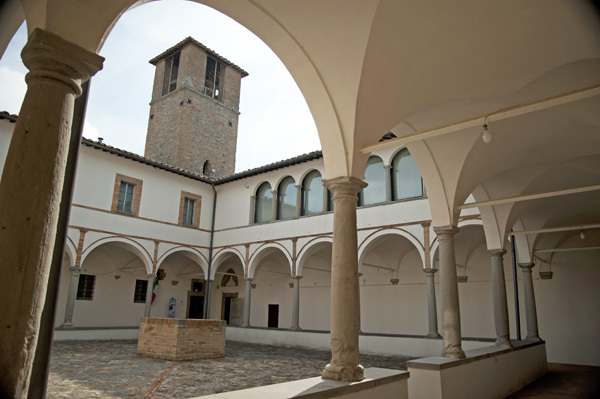 Opened in 1995, the Museum is housed in the Church and Convent of St. Francis. Part of the original furniture has been placed in the properly restored Church, while the Conventual spaces are used to display paintings, sculptures and furnishings from the churches of the hamlet; these objects became municipal property as a result of the confiscation of religious guilds’ goods operated in 1860 by the new-born Italian State. Among the most valuable works there are the wooden group of Deposition, which can be dated between 1260 and 1270, the Gonfalone (flag) depicting the Madonna della Misericordia by Bartolomeo Caporali, painted in 1482, the Annunciation made by Tommaso di Arcangelo “Il Papacello” from Cortona and Vittore Cirelli in 1532 and the Immacolata executed in 1551 by Cirelli himself. The collection of fabrics is very significant and it can be dated between the 15th and the 19th century, which also includes six “tablecloths” from Perugia made of cotton and linen with the typical white and indigo colors that can be dated between the 15th and 18th century. 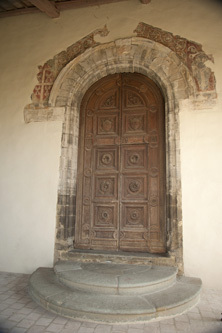 The original furniture of the Church, whose decorations in fresco are the most important part, even in their fragmentary state, is now consisting in the 15th century wooden choir, the Counter of the Magistrates made in 1505 and the Portal realised by Antonio Bencivenni from Mercatello in 1519. Other valuable works got lost between the late 18th century and the 19th : we can cite among these the illuminated Codex commissioned by Carlo Fortebracci and his wife Margherita Malatesta in 1469 which is stored today in Gerli Villagaeta’s collections; the Madonna and saints painted by Berto di Giovanni for the altar in 1507 which is currently divided between the “House of Raphael” in Urbino and Buckingham Palace in London; the board realised by Luca Signorelli for the chapel De Rutanis in 1515, which is now displayed in the National Gallery in London. From April to May: Friday, Saturday and Sunday from 10.30 am to 1.00 pm / from 3.30 to 6.00 pm. From June to September: Friday, Saturday and Sunday and public holidays from 10.30 am to 1.00 pm / from 4 to 6.30 pm.